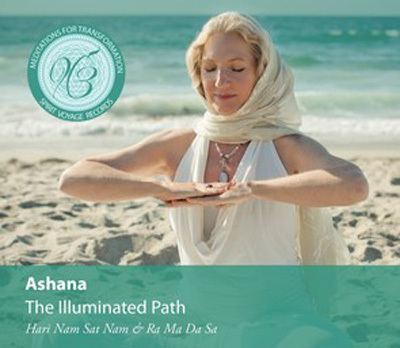 Ashana's beautiful vocals and expansive Alchemy Crystal Singing Bowls will accompany you on this meditation journey and keep you on The Illuminated Path. Ashana provides Lead and Background Vocals, Shanti Chimes and Alchemy Crystal Singing Bowls with Thomas Barquee Keyboards & Programming and Background Vocals while Simone Sello plays Electric and Acoustic Guitars, Sandip Chaterjee the Santur and Pankaj Mishra plays Sarangi. The first part of this mantra aligns the powerful creative flow of life (Hari Nam) with your personal Identity and destiny (Sat Nam). The second line aligns your intuition with your intention so the unseen hand of spirit supports your fulfillment. You are alert to any positive or negative input that can sway you from your essential path. You can find the silver lining in any cloud. You defend by awareness, not by reaction or threat. You guide your project through all the interest that would interfere or stop it. You pass the challenges and sail towards fulfillment. When balanced, you can say and mean, All this life is Your Gift. The pain and tragedy are as sweet as nectar.